/ Comments Off on How Big Is a Garage Door? Garage doors are built to standard dimensions. Choose a garage door based on the size of your garage and vehicles. Here’s a run through of some of the most common sizes for garage doors. Standard sizes for a single-car garage vary by width. You can buy a door that’s 8, 9 or 10 feet wide. These doors accommodate an SUV, car or small truck. The usual height of garage doors is 7 to 8 feet. Unless you’re parking a golf cart or a similarly tiny vehicle, don’t choose a door smaller than 8 x 7 feet. This size will work for a structure that’s 9 -10 feet wide. Some small homes, especially older ones, have garages of that size. They’re designed to hold a car and not much else. While people have been pulling in and out of small garages for decades, contemporary tastes generally call for a bigger space. 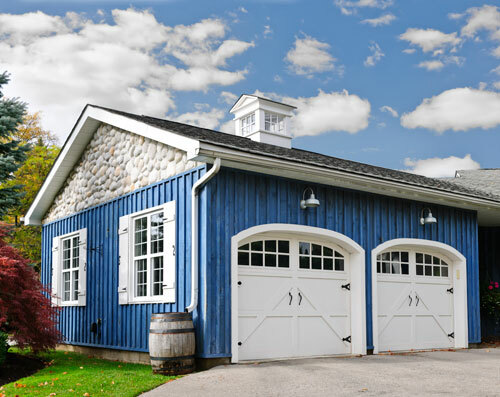 If you’re building a single-car garage, consider installing a 9- or 10-foot wide door if you have the room. A wider door decreases the chances of scratching your vehicle while driving in or backing out. A bigger door will also accommodate a range of vehicles. A standard single-car garage door won’t work if you have a large vehicle or more than one car. For those situations, you’ll need to get either a double door, two single doors or some other combination of multiples. Double-garage doors are generally range from 12 to 18 feet wide, with 16 feet being a common width. A height of 7 to 8 feet is standard. These doors are big enough for a two-car garage and can easily accommodate a bigger truck. Many people prefer a double garage even if they park just one car inside. The modern garage stores all kinds of belongings. A wider door makes it easier to get things in and out. If you’re replacing a door, you’ll most likely want a new door the same size as the old one. For new construction, consider a design that works for your needs and adds value to your home should you decide to sell. Like cars, recreational vehicles come in a range of sizes. Today’s RVs are tall. Structures 16 feet high will accommodate most rigs. RV garage doors come in standards heights of 10, 12 and 14 feet. Widths vary, but 12 feet is a good size if you’re parking a single RV. As you can see, there’s more than one answer to the question, “How big is a garage door. ?” Ponderosa Garage Doors can help you choose the right size garage door. Contact us today for a free estimate.